There are many different household pests that have the potential to invade your home at any given moment. If you don’t respond quickly to the signs of an infestation, it could become an out-of-control situation. This is especially true with weevils. This small and stubborn pests can take over your home if you ignore them or fail to call a pest control company immediately. Weevils are types of beetles found in many shapes and colors. However, their most distinctive feature is the shape of their heads. As an adult, every weevil has an elongated head with a snout. The rice weevil is one type of weevil that commonly appears in homes. They are small black bugs that sneak into the home in grains and pasta. At just two to three millimeters long, the rice weevil is very small and stout in appearance. It ranges from reddish-brown to black in color, usually with four light yellow or red spots on the corners of the forewings. Its snout measures an entire millimeter, which accounts for a third of its size. It’s important to note that the rice weevil is one of the most widespread stored grain pest worldwide. Rice weevils originated in India but spread across the globe through trade. The southern United States, with its warm climate, deals with infestations of rice weevils more than any other area of the country. Mature adult rice weevils feed on whole grains like wheat, oats, corn, barley, rye, and even other items like cashew nuts, cereal, and macaroni. If you believe that you have rice weevils in your house, the single most important component of eradication is finding the source of the infestation. Weevils are known to move beyond the cabinets and pantry, so an exhaustive inspection is necessary to find all bug locations. Extreme heat and cold can both kill weevils once they are discovered, as can special sprays and other applications. This isn’t a job to do alone, so it’s important to contact an experienced and environmentally responsible pest control company like Green Solutions Lawn Care & Pest Control. Green Solutions serves the Tampa Bay area with the best family-friendly pest control services, so call (813) 684-7336 today to learn more. 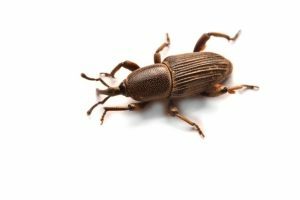 Share the post "How to Identify a Weevil Infestation"